Writing is indubitably my favorite pastime. It is my passion and escape from what is an otherwise dull, and limiting world known as reality. I've been writing for as long as I can remember, and it was my sudden interest in PokÃ©mon that actually kindled my love for writing. Although I am not very interested in the whole fan-fiction facet, my very first "completed" work of literature was ironically a fan-fiction. It was a crappy spin-off of The Rise of Darkrai, in which I had my older brother (who like I was rather young at the time) co-author the book XD. My favorite genre to read and write is fantasy-fiction. 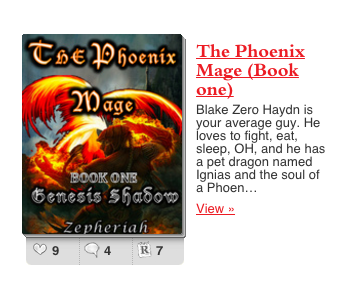 I believe that the fantasy subgenre is the least limiting. Feel free to ask me for writing advice, or give me any if I make any notable mistakes. 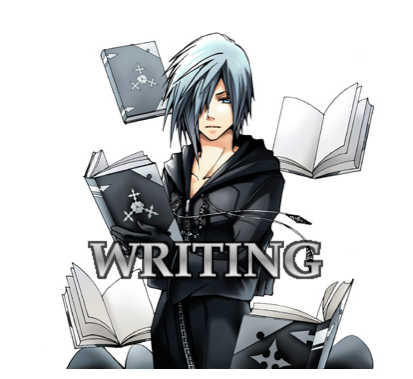 Also, if you ever want to RP or just discuss anything about writing in general, don't be shy! 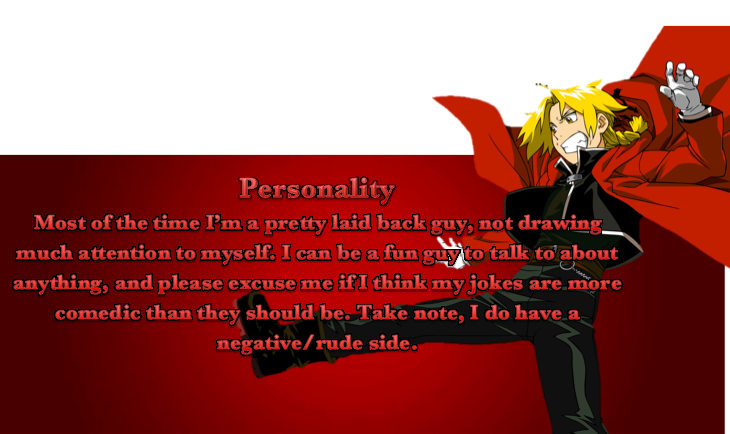 I do enjoy watching anime, and no I do not identify myself as an otaku or a weea-whatever. I am just one of those guys that likes anime, no need to label me. 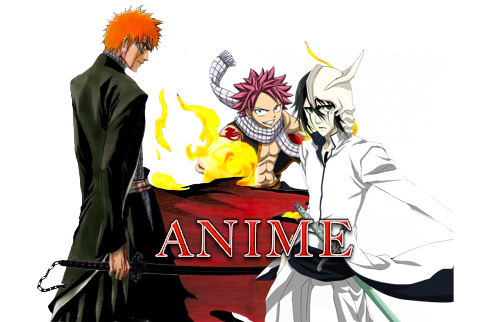 My interest in anime started when I was young, and my gateway anime was Bleach, which is still my favorite anime this very day. When it comes to Bleach I will be biased regardless of what you may throw at me. Along with Bleach, I've grown up watching Yu-Gi-Oh, Pokemon, and Bobobo-bo Bo-bobo. My god Bobobo was HILARIOUS. Other animes I've thoroughly enjoyed include A certain magical Index, Fullmetal Alchemist:Brotherhood, Fairy Tail, and Inuyasha. I love to game. 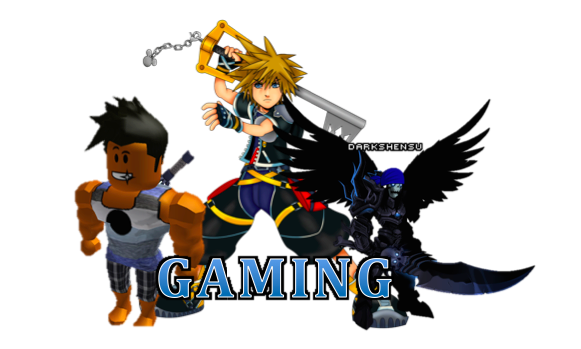 That being said, my favorite gaming series is most definitely Kingdom Hearts! Ask me any question about it and I promise I can answer it C;. On the side, I am an avid First Person shooter gamer. My favorite FPS games include all Halo's (Except for Halo Wars...that was crap), Call of Duty, Fallout, Battlefield, and Destiny. On the PC I play games ranging from Roblox, DDtank, CS:GO, Adventure Quest Worlds, Territory War Online, and occasionally, if I gather my hackmons, Pokemon Showdown. -I am very athletic, which supplements my nerdy side. -Sports include: JROTC Raider Team (Army based strength team), Cross Country, Football, Wrestling, and Indoor and Outdoor Track. -Favorite actor is Jet Li. Any movie with him, you name it, I've seen them all. -Music wise, I listen to everything, and I mean everything, BUT country and Dubstep. I'm not kidding, I listen to everything from Rap, and hip hop, to J-pop, metal, punk, and even more. -I love you...yeah, you! Now go out and have a wonderful day you beautiful human.